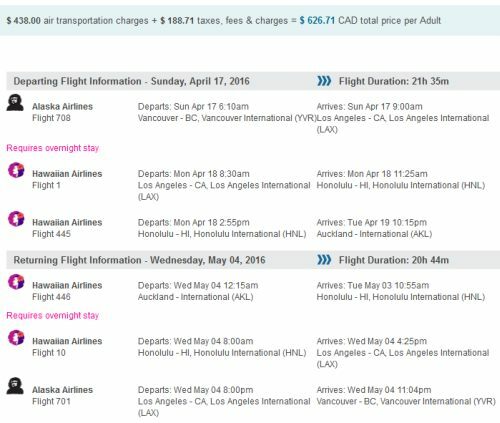 There are some really insane prices from Vancouver to Auckland, New Zealand at the moment, using a combination of Alaska Airlines and Hawaiian Airlines. 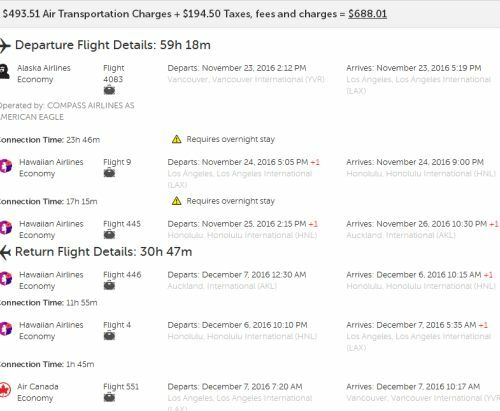 However, the flights do require an overnight stay in Los Angeles on the way there, and in Honolulu, Hawaii on the way home. The layovers are 21-24 hours in length at each stop. NOTE: The total flight duration showing on Flight Network does not seem to be accurate for these flights. It does not seem to take into account the one day layovers in Los Angeles and Hawaii. 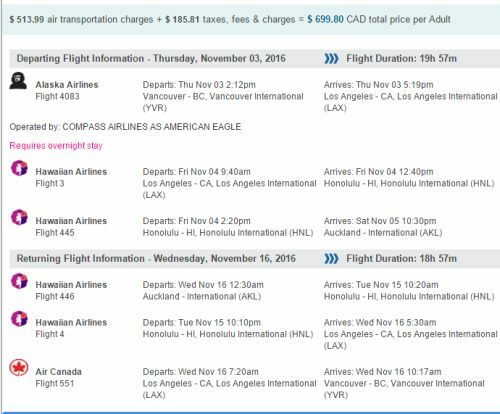 Update 4/18 @ 7:27 PM PST - There are now some August, September, November, and December 2016 dates for $725 to $790 CAD roundtrip including taxes. They can be found on Flight Network for $699 CAD roundtrip (before the $10 off promo code) or on ITravel2000.com for $684 CAD roundtrip (no promo code required). True, although to be fair, this is a highly unusual price to New Zealand. 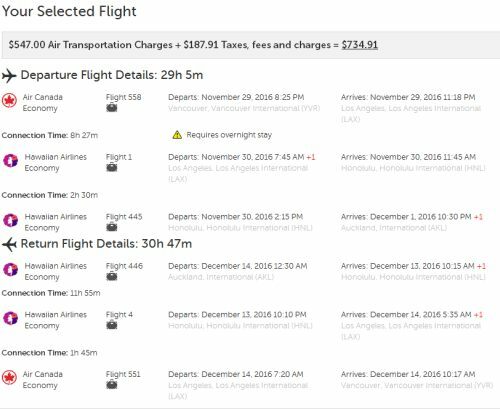 A highly unusual price from Vancouver to Toronto is in the mid $300s CAD to mid $400s CAD roundtrip (has happened a few times in the last year). 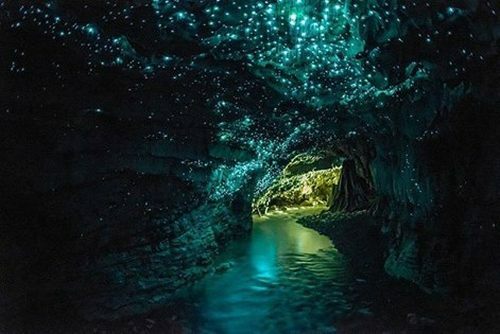 Update 5/6 @ 3:14 PM PST - A few Vancouver-Auckland flights from late November to early December have dropped to $688 CAD roundtrip including taxes. vancouver, yvr, flight deals, alaska airlines, australasia, new zealand, oceania, auckland, akl and hawaiian airlines.